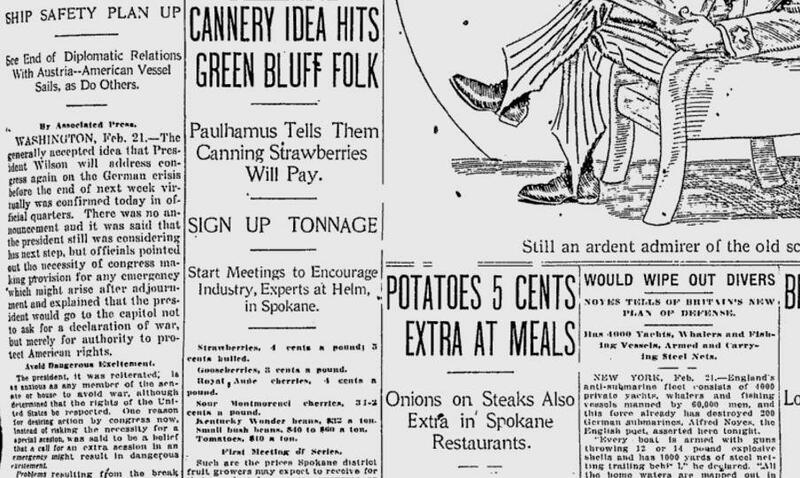 The Spokesman-Review said that the potato would soon be “classed as a luxury,” and that Davenport’s Restaurant was now charging an extra five cents for any meal with potatoes. Other restaurants had followed suit. This was a symptom of a larger national food shortage. The country’s potato harvest had been uncommonly small. In other short harvest years, the U.S. had imported potatoes from Europe, but it could not do that in 1917 because of the war in Europe and the peril faced by Atlantic merchant ships. From the cannery beat: A Puyallup cannery owner came to Green Bluff to ask fruit growers if they would like to have a branch cannery. He told them that they would earn four cents a pound for strawberries, three cents a pound for gooseberries, and between three and four cents for cherries. The Green Bluff schoolhouse was “packed” with growers for the meeting and the strawberry growers indicated a “unanimous sentiment” in favor of a cannery. Published: Feb. 22, 2017, midnight Updated: Feb. 22, 2017, 3:04 p.m.